The Stamina InMotion Compact Strider is a great choice even if you are looking to test the waters with an under-desk elliptical. It’s price tag is undoubtedly the USP. But it’s a very well made durable product that has a great customer rating on retail portals. Hard to go wrong with this! Stamina is one of the brands that have been making huge inroads into the workplace fitness category off late with a flurry of impressive products. The InMotion Compact Strider is one of their flagship offering that aims to fill a void for budget priced under-desk elliptical machines. It has a under $100 price tag which makes it impossible to ignore. At a time when the market is flooded with fitness equipment that are shabbily made or thrown together, does an under-desk elliptical with a rock bottom price tag really cut it? Or is it another sorry excuse of a product that has been assembled in a backyard factory to capitalize on the demand? Here’s EllipticalHub’s review of the Stamina InMotion Compact Strider. Stamina offers a lot of configurations in its elliptical machines. You can choose from a full sized elliptical machine for home use, the compact strider for under-desk use and the compact strider with upper body workout cords for a more intense full body workout session during your work time. The compact strider is the entry-level option and the one that we will be speaking about today. As the name suggests, it is a strider which means, it lets you make short strides which have a more horizontal movement as opposed to the vertical circular stride of an elliptical. When used under the desk, this is pretty effective to add some miles to your daily tally and burn some calories in the process. It does take some assembly. But the process is pretty straightforward and you should be done in about 10 minutes without any assistance. 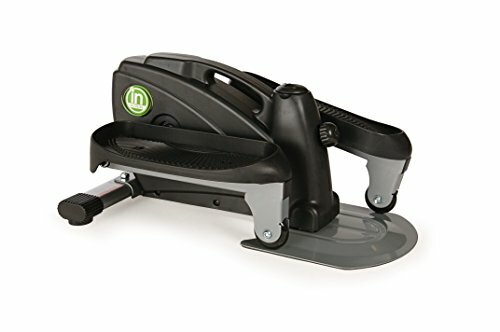 The Inmotion Compact Strider looks much better than some of the other under-desk elliptical machines. It has a sleek semi-gloss polycarbonate casing with wide and non-slippery footrests. There is a carry handle positioned between the pedals and the in-built LCD monitor and tension-control knobs are positioned on the front of the machine for easy access. Design wise, it is nothing fancy. But at the price point, it is way better than what we expected. At the top most position of the pedal, your sole is approximately 12 inches above the ground which makes it one of the lowest profile elliptical machines. This translates into lesser chances of your knee bumping under the desk even if you are above average height. We have witnessed some very intense workout sessions with under-desk elliptical machines. The Stamina InMotion Strider is no different. If you are willing to go beyond the first two intensity settings and crank it to the top setting, it becomes almost impossible to pedal and you will feel your thighs groan. Alternatively, you can reduce the intensity and up your pace to the point that you are performing an HIIT workout. There is minimal noise and the machine stays stable without wobbling making it a great choice for a workplace. The heavy-duty track wheels have a smooth rolling motion which makes it easy to use even if you are looking for a slow and low impact activity. Unless you are pedaling at the rate of knots, most people wouldn’t even realize about the machine. Some customers have been able to hit 24 miles a day with the Inmotion Compact Strider. How’s that for a grueling workout while you are at work? If this is the first time you are using an under-desk elliptical, then you may take a while to get acquainted with the shorter strides though. Take your time to get adjusted before you increase intensity. Well, to be honest, there is nothing wrong with the Stamina InMotion Compact Strider considering the price point. It offers unbeatable value and is one of the most perfectly designed elliptical units.